Scientists hope that this will advance the fight to save lives by creating lab-grown organs. Juan Carlos Izpisua Belmonte via National GeographicThis pig embryo was injected with human cells early in its development and grew to be four weeks old. Scientists have created the first successful human-animal hybrid, or what is known as a chimera, in a laboratory. Led by the Salk Institute, the international team of researchers announced the achievement this past Thursday in the scientific journal Cell. 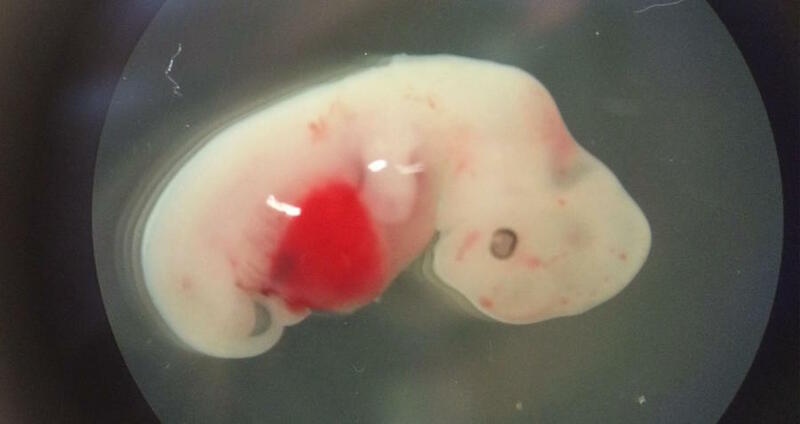 The team succeeded in creating a chimera by injecting human cells into pig embryos and letting them gestate together. While pig organs take less time to develop than human organs, the two closely resemble each other. Juan Carlos Izpisua Belmonte, a professor in the Salk Institute’s Gene Expression Laboratory, thus told National Geographic that the human-pig chimera concept seemed straightforward enough. Nevertheless, he stated that it took more than 40 collaborators experimenting for four years to get the formula just right. A major turning point was pinpointing when the team needed to introduce the human cells into the pig embryos. To not kill the embryo, the timing had to be just right. “We tried three different types of human cells, essentially representing three different times [in the developmental process],” lead study author Jun Wu told National Geographic. When the team ultimately implanted the properly developed human cells, the embryos managed to stay alive. The team then put those embryos into adult pigs for between three and four weeks before removing them for analysis. Now, researchers hope that this breakthrough will help alleviate the critical shortage of human donor organs: 22 people on the national waiting list for organ transplants die every day, while a new person is added to the list roughly every ten minutes. And because policymakers, largely influenced by religious conservatism, have prohibited the investment of public funds in research like Wu’s, private donors were needed to fund the Salk research team’s work on the chimera project. Next, check out how this pioneering procedure cured two infants’ leukemia, before seeing how this 3D bioprinter prints human skin.